Photo: 19544..Canadas polar bear country around Churchill, Manitoba, at Gordon Point and nearby at Cape Churchill in Wapusk National Park on the south edge of Hudson Bay. 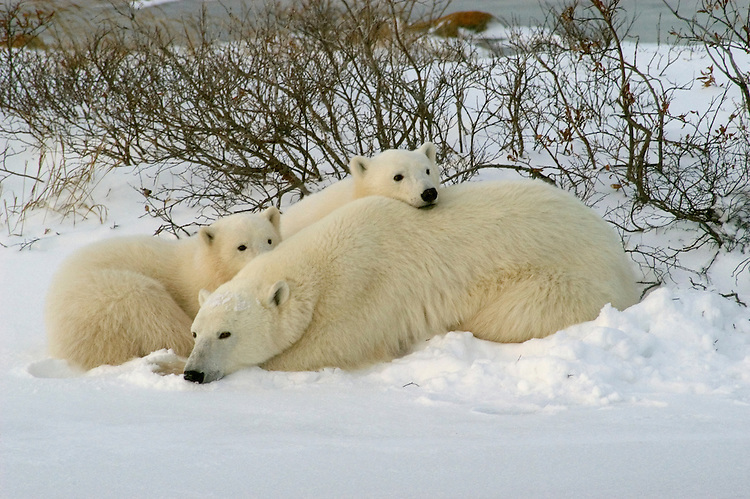 Photos of polar bears males, females, and cubs. Fauna includes polar bears, arctic hares, and arctic foxes. Landscapes of the tundra terrain and ice forming on Hudson Bay, plus sunrises and sunsets. Polar bear viewing in Tundra Buggies while staying at the Tundra Buggy Lodge, operated by Frontiers North. Photo copyright Lee Foster, 510-549-2202, lee@fostertravel.com, www.fostertravel.com.